The hotly anticipated glaive-slicing game that you've all been keeping tabs on has finally arrived, but will it be worth the excruciating wait? 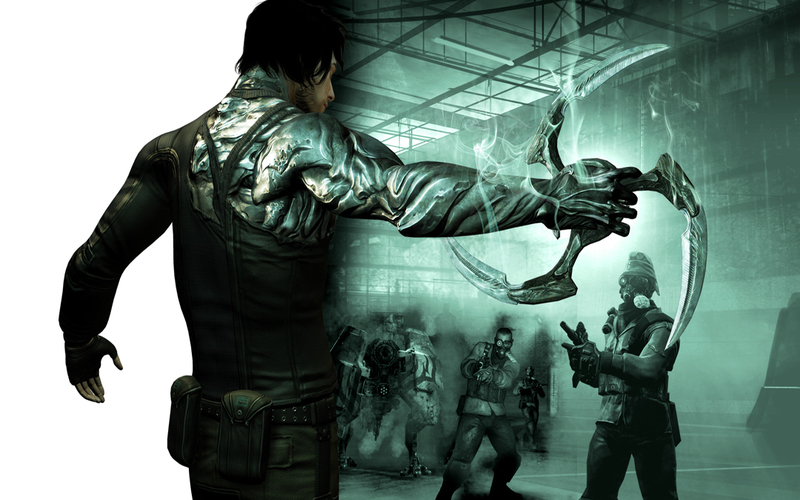 Glaive: The story of Dark Sector placed you in the shoes of elite Black Ops agent Hayden Tenno. The single-player game starts off with a dramatic black-and-white prologue mission set some 20 years before the events of the other nine levels. This level is mainly used to get used to the controls of gunplay and for kicking off the obviously weak story. You will be able to get comfortable with the controls quite quickly, and you won't have much trouble with making your way. Sadly, the AI hampers the beginning good experience with their moronic behavior. They will constantly rush you for the embrace of death, or simply stand idle as you advance on their cover. The previously mentioned story is evidently broken. Characters come and go without giving you any reason to care about them, you travel between locations killing everything that moves without a great explanation as to why. Also, new abilities are frequently added to your overly powerful arsenal without explanation. Dark Sector's lack of good storytelling shouldn't hamper your enjoyment of the game too much because cutscenes are infrequent and brief. Nonetheless, a game with such an intriguing character should have a decently told backstory. To say that Hayden is a powerhouse downplays just how incredibly powerful you feel when playing. The powerful weapons that you that you first acquire in the prologue mission stick with you, but you are still given more powerful weapons with the killing power of an atomic bomb. You won't be using them very much though, as the only beefed-up weapon that you need is the glaive. The glaive is an invulnerable discus that can even be thrown through fire and ice to adapt those qualities. The super-Swiss army knife can even put fires out. I AM INVINCIBLE: The greatest portion of Dark Sector is the combat, but even that feels like a chore after a while. When using the glaive, you have the ability to launch it across the field to decapitate an enemy, or just kill one with a single throw. Despite the dull enemies and your formidable glaive discus, the "battles" that you will face (you are often against 100-1 odds) they always feel like killing zones put there just to let you vent. The way-to-easy boss battles even feel like that the majority of the time. When you face a boss, the battle simply boils down to how and when to attack. Most of the time, if you are hit with a boss-fueled blow, the edges will glow red (remind you of a certain COG's health monitor?) and you will have a large window of recovery (although you don't need it because Hayden recovers his health in a remarkably quick fashion). Multi-Glaives: Although the single-player is disappointing at best, it will prepare you for the multiplayer. Both of the online games, titled Epidemic and Infection, are designed for 10 players and can be played on any of five specially designed maps. Epidemic pits two fireteams of five; each led by a Hayden, against the other team in a rush to kill the opposing team's Hayden. Infection tasks one player, (as Hayden) with killing as many of the other nine players as possible before they manage to bring him down. When you're not playing as Hayden, you assume the role of a garden-variety soldier armed only with a single firearm, some explosives, and the ability to move in and out of cover. One Hayden versus nine might not sound like a fair fight, but when you use all of Hayden's massively powerful abilities in conjunction with shield and stealth abilities, Hayden's glaive-and-firearm combo gives him a significant edge over the competition. Ultimately, the multiplayer is pretty balanced, and the fact that there is rarely ever any lag doesn't hurt. Though, one could wish for a couple more MP modes. The fact that there are only two MP modes makes me feel like they missed a lot of opportunities with the multiplayer. Rent vs. Buy: Dark Sector is a decent game that fails to be nearly the impressive game that it was expected to be. The creepy visuals, and the top-notch sound help immerse you, even if the story doesn't. The multiplayer feels a little empty with only two modes, but those two modes are pretty enjoyable to play through (but don't play with the witless bots) as either Hayden or the soldier. Overall, Dark Sector is a decent game, and you could do a lot worse if you're looking for some shooter action. It doesn't play nearly as well as Gears of War does, but it does well enough.